1).Barack Obama, has wrote an article about Narendra Modi in which of the following publication? 2).Foreign Minister of __________, Mr.Vladimir V Makei has recently visited India. 3).Among the following which ship is NOT participated in Yemen rescue operation? 4).Civil Service Day was observed on__________. 5).US and EU has resumes trade talks in New York on a controversial of _______. 6).Which among the following state has launched Subodham project to end liquor abuse? 7).12th National Youth Athletics Championships held in______. 8).Ashish Jakhar is related to which of the following sports? 9).Which of the following state has setup a task force on agriculture development and poverty alleviation to address the issues? 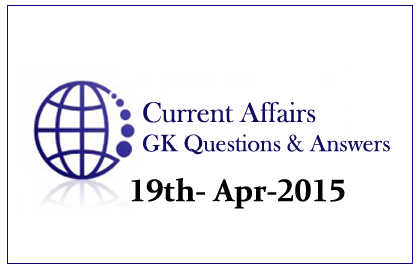 10).Which of the following is related to Amarnath Yatra?